He's directed some of your all-time favorite films, including Stand by Me, This Is Spinal Tap, The Princess Bride, When Harry Met Sally, and he's back with another charming coming-of-age comedy called Flipped, based on Wendelin Van Draanen's bestselling novel. Last week I caught up with legendary filmmaker Rob Reiner over the phone for an interview regarding Flipped and we talked about what goes into his films, his inspiration and connection with stories about our youth and growing up (like Stand By Me) and much more. It was a delight to talk with Reiner and if you're a fan of any of his movies at all, this is must read interview. Speaking of Flipped, I've seen the film and it is wonderful, a definite throwback to his early days of Stand By Me, and it's a great movie to watch with your whole family, or the love of your life, and I guarantee it will put you in a fantastic mood by the end. The two lead performances from Madeline Carroll as Juli and Callan McAuliffe as Bryce are amazing, some of the best you'll see from kids that age in a long time. It deserves as much attention as I can give it and I hope everyone takes the chance to see it in theaters while they still can! It's been quite a while since you've directed a film that was about youth and growing up and those kind of stories. 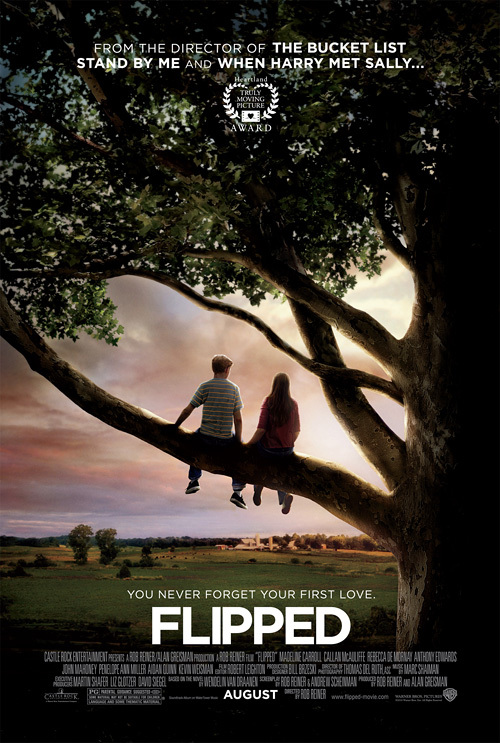 What was it with Flipped that made you want to return to that kind of story again? Rob Reiner: Well, my son, Nick who was 11 at the time, he's almost 17 now, but he had been assigned this book Flipped at school and he brought it home and we read it together. And I was completely knocked out by intelligent and how deep the exploration of first love was. It took me back to the feelings I had when if first read Stand by Me, which was actually called, The Body, it was a Stephen King short story and it reminded me of the feelings that I had when I was 12 going on 13 when I first fell in love. And so I thought this would be a great companion to Stand By Me because Stand By Me explored the first powerful feelings of friendship and this was about the very confusing feelings you have when you first fall in love. Was now the perfect time to make this or was it just that production and financing all came together at the right time? Rob Reiner: No, actually, just like I say, I came across it and the book is actually set in the present day and I decided to set the film back in the late '50s, early '60s because that's when I came of age and that's when I had my first big crush. Well, I was going to ask if your inspiration comes from your own experiences in your youth? Rob Reiner: Yeah. You know, you-- I don't think anybody ever forgets the first person they fell in love with. That's something that everybody remembers and it doesn't matter what the time period is or where, I mean, those feelings are always the same. So I thought that would be a universal thing and it's something that I had never explored. I certainly have explored men and women and different stages [of love] but never that first flush of feelings of love. Are there ever elements from the experiences of the characters in the story, especially because you said you changed the timing on this, that you wish you had experienced growing up? Does it ever become sort of a fantasy aspect to you? Rob Reiner: No, I mean, usually what I try to do is I look for something that I can relate to and where the characters are experiencing something that I have experienced and so I understand what they're going through. It's the only way I really know how to tell the story is to be able to kind of live through the characters. So when I find something that resonates with me it's usually because it cuts to something very real inside of me, something that I've gone through or experienced. Rob Reiner: Yes. That's one of the things that struck me about this book, the idea that it would literally flip back and forth from both the boy's point of view to the girl's point of view and you got these two different perspectives. And when I read the book I thought, well, it's definitely holding my interest and I'm totally wanting to now know what she thinks about this thing that just occurred from his point of view and it worked for me and it kind of held my interest. And when I went to make the film, I thought I don't know if the audience will sit still for seeing the same thing told twice except from a different point of view. But I kept going back to how it made me feel when I read the book and it worked for me, dramatically it worked for me, so I thought, well let's keep it. And so that's how we decided to do it. And I think it does work, I mean, you really do want to know what was her take on it after you've seen his take. For me it's a really fresh way of seeing that story play out and like you said, I just loved watching it, I just loved seeing both sides of the story especially following where it goes with the more larger flip - without spoiling too much - of the two characters and their interest in each other. Rob Reiner: Right, well the fact of the matter is boys and girls just see things differently, they just do and it doesn't matter what age, it could be from the time they're very little till right till the end. Men are always trying to figure out what the heck is going with the women and women the same with men. So I like the idea that you're telling it from both points of view. Besides the setting, were there any other major changes you guys made while developing the script to get it to the shooting stage? Rob Reiner: No, the big change was setting it back in that time period. The characters are basically the same, the story is the same. We had to take some things out that we couldn't use in the film because it would just be too much but it's essentially the same story that Wendelin Van Draanen put in the book, it protects the integrity of that story. And there's even the tree and the central aspect of the tree? Rob Reiner: Yes, the tree is there and the whole thing with the eggs and the thing with Juli's uncle and all of that stuff is in the book. Now that you mention it, I guess it goes to show how timeless a story like that is, how it can be told at any time. Rob Reiner: That's what I believe, you know. And I mean, it was interesting, I learned this years ago, when I did Stand By Me, somebody once said to me -- came up to me and told me how much they loved the film and they said, "It reminded me exactly of when I grew up." And I said, "You mean you grew up in a rural area?" And he said, "No, I grew up in Manhattan." And I thought it doesn't really matter where you grow up or the time if you capture these kind of universal feelings that we all have. And they're very powerful when you're going from 12 to 13 from the letting go of that last little vestige of childhood and having a little toe go into adulthood, it's a very, very emotional, confusing time. And it affects everybody the same regardless of when the time period is or where you were brought up. I always feel like it's amazing that even at any age we all still love to revisit that, even if it's painful, it's still something we all love to revisit especially in terms of the seeing it on a big screen and seeing a story presented this way, I mean I love it. Rob Reiner: Yeah, because you never forget the first person you fell in love with it, it never goes away. You can live your whole life, you'll always remember that first big crush that you had. How important was it to, obviously, find the two lead actors to star in this? I think without Madeline and Callan this obviously would not have been the same movie or wouldn't have even both close to being as great as it was. Rob Reiner: No, it was critical, as a matter of fact I told the people at Warner's who were financing it, I said, "If I can't find the right two people to play these parts-- and they're two 13-year olds that essentially carry the film." I said, "If I can't find the right two then we won't make the film." And luckily I found two amazing actors. I mean both Madeline Carroll and Callan McAuliffe who play Juli and Bryce, they're as sophisticated actors as any adult I've ever worked with, their craft is as developed as any adult I've ever worked with. How do you get such incredible performances out of them? I mean, to be honest when I watch films with actors that young they're usually not doing a great job. So how did you do it with these two? Rob Reiner: Well, first of all you have to find the right people. I mean, when I did Stand By Me, a couple of the boys didn't have very much experience at all and some of them had no experience. So I eventually had to work with them almost like in acting classes, work with them and before we even approached the script to get them up to speed as to certain techniques and ways to approach things. With these two, it wasn't that difficult because like I say, they came with these incredibly developed instruments that they both had, so it wasn't as difficult with them, it was just a matter of finding the right people to do it. Do you think-- and I know you said that this isn't really an issue with these two, but do you think that experience with those youth actors sometimes make a difference? Like sometimes when you get the new guys who aren't used to the acting system even at a young age, do you see more of those kind of actors doing a better job than those who are more experienced, I mean the inexperienced versus the experienced ones? Rob Reiner: It depends, a lot of times you'll find a kid who has no experience but has a gut instinct for acting and has great natural instincts, those kids are great because you can mold them. But it's always good if you can find somebody who has a craft and knows what they're doing because it's a little easier when you have somebody who really knows what they're doing. What's it like on your sets? And that's actually something I wanted to get into a little bit, is that I notice and this is a question for you, is I notice that it sort of feels like a more contained studio setting. Do you shoot much on location? Rob Reiner: Well, this film we shot completely on location. The whole film was shot -- well, we shot Bryce's interiors, we shot that on a stage, but all shot in Michigan, all the exteriors. And all of Juli's stuff, even in her house was shot in a house that we built on a street outside of Ann Arbor, the whole film was shot in the areas outside of Ann Arbor. Do you like having that control over the sets? Because that's what it seems like when I look at your films is that there's a beautiful style that every shot is almost a beautiful shot and it feels like you have a lot more control in putting together exactly what pieces of the set we're seeing. Is that something you really strive for? Rob Reiner: Well, a lot of times I'll make films that are mostly character driven films, stories that involve people. Like I make the joke, I like to make movies about human beings that live on Earth. And so when you're doing those kind of films they don't usually give you that much money to make them so you have to plan them pretty well to make sure that you have enough -- you're getting everything you need in the short amount of time that you have to shoot. So I do plan things out in my head at least how it should look but you have to leave enough room for those serendipitous things that happen on the set. Was there anything that you guys sort of picked up like that, just being on that location in Michigan and just being in the house that just naturally came from being there? Rob Reiner: Yeah, sometimes we did. I mean, in the scene where they're getting ready to go to -- the Bakers are getting ready to go over to the Loski's house, if you remember, she's got these pies and one of the pies almost drops and she says, "You don't…" And all that was improvised, it all just happened and I just let the camera role and said, okay this seems very real and natural of a family -- she's very nervous about going over to her next door neighbor's house and she's never been there before and is very anxious about it. So that just kind of just played out the way it just happened. Do you encourage a lot of improvisation on the sets? Rob Reiner: If it comes out of a natural place, I do. Most of the time, like I say I don't have a lot of time to do that, I have to plan everything pretty carefully. And not everybody is a great improvisational actor, some people are very good at it and other people want to have the dialog. So I have somebody's who -- like for instance Spinal Tap was completely improvised, the whole thing was improvised, but all of us were steeped in improvisational theater, so we all -- that's what we knew how to do. And with John Cusack in The Sure Thing, he did a lot of improvising but he felt comfortable doing it. So if you have actors that are comfortable doing it, I encourage it, but a lot of actors get nervous of having to do that, they'd rather have things laid out for them. It's interesting to hear, sometimes when I see a film and I feel like it's improv'd and natural and then I ask and they're like, "No, that was all scripted." And then it's almost vice versa sometimes with other films. Rob Reiner: Yeah, that just means they've done a good job because it's supposed to look like it's just happening, if it is very well scripted. You were talking about a little bit about the budget earlier and that's something I've really been intrigued by with a lot of films these days is the balance between how much of a budget they think they need and how much they really need to actually shoot a great film. Do you prefer to work lower budgets to get what you want? Rob Reiner: No, I just hopefully have enough money just to be able to realize the film that we've got on the page. I mean, whatever it takes. I don't feel like I need tons and tons of money because like I say, most of the films I make are these small, kind of character driven stories so I don't need a lot of money. But you do need at least enough to be able to tell the story well and make it look good. This one only cost $13-1/2 million… which is very small in this day and age. Oh yeah. I mean, it almost goes into that realm of indies nowadays, there are indies that cost more than that! Rob Reiner: Yeah, well it is like an indie film and that's why -- it's a film that plays for the audience, they love it. I mean, every place we've played it we've gotten a tremendous response. But it's a tough film to market, it is like an indie film -- it's totally an indie film. So hopefully people will find it and tell other people because every time people see it they go nuts for it. That happened to me too, like I said, I loved it. Do you think the studio system in general has become more restrictive or limiting in the last couple of years or even since you got your start? Rob Reiner: Yes. It's becoming more and more difficult to get these kinds of films made. I mean essentially the studios want to make these big franchise tentpole pictures, stories that come from Comic-Con. They either want a big star, they want a superhero or something like that. And these smaller human pictures, they don't typically get made at the studios. I mean, the only reason that I got this one made here at Warner's is because I had a relationship with Alan Horn who runs the studio. But for the most part these kind of films are relegated to the indie companies. And so basically you have these huge big budget pictures and then these very, very small pictures, there's virtually nothing in between. Do you think if there were films that sort of could still get in the in-between, would that really benefit them, do you think we'd see a more wide variety of great films? Rob Reiner: Every time you have a picture like this that makes money, it does help. A few years ago they had Juno, Juno did tremendous business and it was a small picture, so did Slumdog Millionaire. But every time one of those pictures makes a lot of money everybody says, "Ah, that's an aberration." Anyway, listen, I have to go because I got to make another phone call. But I loved talking with you. Sure, definitely. Again, thank you very much for your time, I really appreciate it. Thank you to Warner Brothers and Rob Reiner for the interview. Flipped is playing in limited theaters now and it opens wide everywhere this weekend. Go see it, it's a wonderful movie! I'm doing a lot of research lately on the indie-tentpole paradigm so it was nice to hear Reiner confirm the suspicions I had that the only ways to get a film like this made these days is inherent connections within the industry. i will love this book.